Montana notaries public hold an important office of public trust. The notary serves Montana’s citizens and businesses by insuring the validity of signatures on documents. To help Montana notaries effectively serve the public, the Secretary of State has created the Montana Notary Public Handbook. 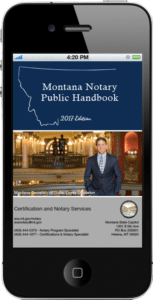 The Handbook includes information about how to become a notary public, how to properly perform a variety of notarial acts, and how to properly journalize performed notarial acts, along with other important information related to being a Montana Notary Public. The Handbook is available in a printable format using Adobe Reader and in a mobile version designed for smartphones. If needed, download Adobe Reader.